What Is a Gas Fill? In a standard glazed unit, the gas between the panes of glass is air. In a gas fill glazed unit, an inert gas is pumped into the sealed unit replacing the air. The term inert refers to a class of chemically stable, non-reactive, totally safe gases. 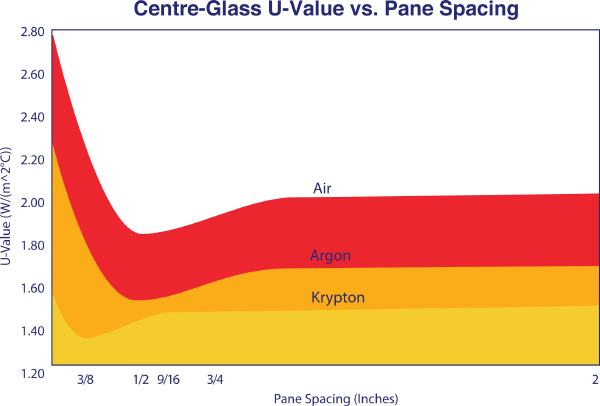 Argon and krypton are the usual choices, with argon being the most common and least expensive. 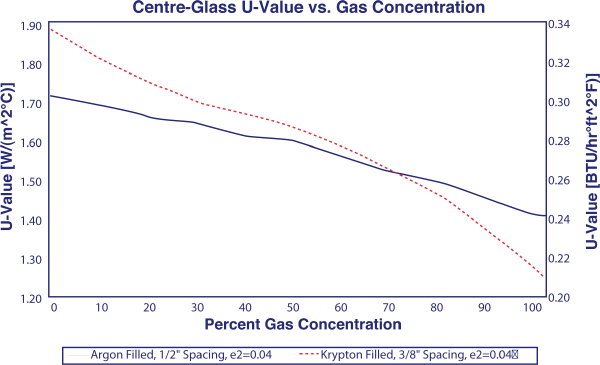 The gas fill improves the insulating value of the window by reducing conduction heat loss because the gas fill has a lower conductivity than air. Although more expensive, Krypton delivers slightly better performance than argon, and allows a smaller optimal space between the panes. A narrower space allows multi-pane systems (triple glazed windows) with less chance of stress breakage. The percentage of gas (argon or krypton) in the sealed unit is very important to the performance. It is not possible to achieve 100% fill and in fact it takes a great deal of effort to achieve 90% consistently. A well-made unit will leak the gas out at a rate of about 0.1% per year.